I hate parenting in the age of technology. It’s so difficult to navigate and manage their electronic usage. I thought we’d go back to school and things would become easier but not so. I am struggling with how much freedom to give my 13-year-old with his phone. Do I disable the internet on his phone just so I don’t have to worry about what sites he is visiting? What is an appropriate amount of electronic time each day? When you guys figure all these things out for me, can you please let me know? I need help! Today is Five Ingredient Friday! I have only recently begun to experiment with spaghetti squash and I am so happy with the results. It has a light, pasta like flavor to it and blends well with lots of flavor combinations. This delicious Spaghetti Squash Chicken Taco requires only four ingredients. It’s easy to whip up because I cooked the squash in the microwave. Yes, it’s so easy! Poke the spaghetti squash with a fork and cook in the microwave for five minutes. This makes it way easier to cut in half. Cut in half with a sharp knife and scoop out the seeds. I only cook one-half at a time and save the other one for later. Place half face down in an inch of water. Cook in the microwave for 10 minutes. It looks daunting but trust me, it’s easy. You can eat these noodles in all the same ways you would eat pasta. I put all my noodles in a bowl and added shredded chicken breasts, salsa, and cheese. So tasty! You can feel good about this healthy, gluten free, low carb lunch or dinner. Poke the squash several times with a fork and microwave for five minutes. Cut in half and save one-half for later. Scrape out seeds with a large spoon. Place squash half face down in a microwave safe dish with 1 inch of water on the bottom. Microwave for about 8-10 minutes. Remove carefully and let cool. Drizzle with olive oil, salt, and pepper. Using a fork, scrape down the sides, close to the edge and make strands. Pour strands into a mixing bowl and toss with salsa and chicken. Pour back into squash and top with cheese. Bake for about 10-15 minutes or until cheese is gooey. I learned this method for cooking squash from the kitchn. Check out my recipe index here. Rebecca, phew I’m so glad I’m not the only one. I totally agree that the internet is so scary and they are exposed to it before they are developmentally ready. You seem to be totally on it by checking in frequently and monitoring it in a big way. I need to take a page out of your book and keep them in my room all the time (the electronics, not the kids!) I’ve pretty much decided I just need to keep them busy all the time so they don’t have time to get in trouble with electronics! There’s way too much technology out there these days, especially for kids. It’s an overload of electronic things, so I can understand your cautiousness and stress! This recipe looks delicious! Love that there’s so few ingredients and pretty easy to put together. Plus, how can I say no to chicken taco 😉 ? Yum!! Oh the trials and tribulations of kids and technology! It’s a never ending battle Karen and it’s very scary what kids can be exposed to at such an early age if we as parents aren’t careful! My advice is to not worry about being the bad guy. We’re helping our kids in the end by keeping the safe from things they are not old enough to handle. I love this recipe Karen. 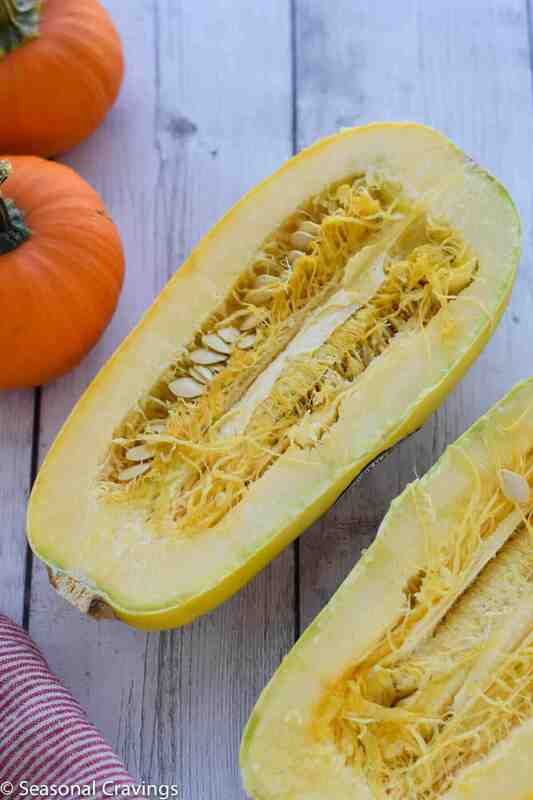 Sounds so easy and so tasty and I’m always looking for new ways to cook spaghetti squash during the fall! Ah! I love this SO much. I’m always looking for something new to do with spaghetti squash, and this is right up my alley! Can’t wait to try it out! I have to watch my carbs and I am always looking for new recipes. Your recipe looks wonderful. Good luck with your daughter, being a parent brings so many challenges. Thanks Gerlinde. Glad to see you here! Good idea Kate! I know my son loves it that I follow him on Instagram ? Oh my gawsh, Boy and I only have children that walk on all 4’s so I can’t really relate to the whole parenting in the age of technology.. but, I do have a niece and nephew and they are ALWAYS on some gadget. So I can totally feel for you!!! Anyways, I am always watching my carbs and I’m obsessed with all squash, so this dish is right up my alley! LOVE the chicken taco mixture!! I want to face plant right into one of these delicious squash boats! Cheers, friend! I don’t even want to think about when my son gets old enough to want to play with electronic equipment! His dad loves video games so I know he will too haha! Tacos are some of my favorite things on earth so I”m loving this taco stuffed spagetti squash!